Chelsea, Michigan Real Estate and Community Info. Chelsea, Michigan, is a charming, primarily rural community which, according to the U.S. census, is home to a little more than 5,000 people. Located about 17 miles west of Ann Arbor and 60 miles west of Detroit, Chelsea’s municipal status remained “village” until residents voted to change it to “city” in 2004. Watch the video below narrated by local resident and celebrity Jeff Daniels. Although it’s only 16 miles from Ann Arbor and not far from Jackson, Chelsea real estate has managed to retain its quaint, small-town feel, while simultaneously evolving into an eclectic and diverse community. Chelsea real estate features a notable number of meticulously maintained, historically significant homes. Recently recognized with a coveted spot on the National Register of Historic Places, downtown Chelsea is like an oasis, providing a quaint, serene escape from the hustle and bustle of the larger nearby cities. Unlike the many small communities in the United States these days, Chelsea boasts a vibrant and thriving shopping district. It’s easy to enjoy a stroll down the cheerful, tree-lined sidewalks of Main Street while you do some window shopping and some actual shopping in the local one-of-a-kind specialty boutiques, gift shops, and farmer’s market. Chelsea also offers a diverse selection of restaurants and cafes. Check out some new clothes for the kids at Vogel’s and Foster’s; kick up your heels at Mule Skinner Boots; and treat yourself to some distinctive wines, spirits and beers, as well as choice meats, breads and cheeses at New Chelsea Market. Who needs the bigger cities most of the time? There are plenty of options within Chelsea’s city limits. Chelsea Recreation offers challenging, fun and affordable youth athletic programs in an environment that fosters a wholesome learning atmosphere devoted to teaching physical and mental skills. Among the sports kids can take up via Chelsea Recreation are basketball, soccer, flag football, volleyball and wrestling. Waterloo Recreation Area is a breathtaking 25,000-acre protected wilderness area that is situated virtually on Chelsea’s doorstep. Hike, ski, or bike on Waterloo’s myriad trails that snake for miles amid the flora, fauna and waterways in this magnificent nature oasis. Golfers will fall in love with Chelsea real estate due to the more than 20 courses from which to choose within a 20-minute drive. And families can pack a picnic basket for a day at Timbertown, Pierce Park or Veteran’s Park. 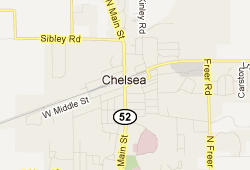 Chelsea found its way onto the map, literally, in 1850 after the Michigan Central Railroad erected a station in town. Most locals today would likely tell you that Chelsea’s claims to fame are as the home of the Chelsea Milling Company's "Jiffy Mix" and the DaimlerChrysler Proving Ground. A wide range of artistic, musical, volunteer and social group activities are available for seniors within Chelsea’s friendly, small town atmosphere. As such, it’s not a surprise that a significant portion of Chelsea, MI real estate includes ideal senior-focused residential communities. In addition to the town’s own Chelsea Community Hospital, residents have the option of checking out the medical services at the nearby St. Joseph Mercy Hospital and the nationally respected University of Michigan Health System.